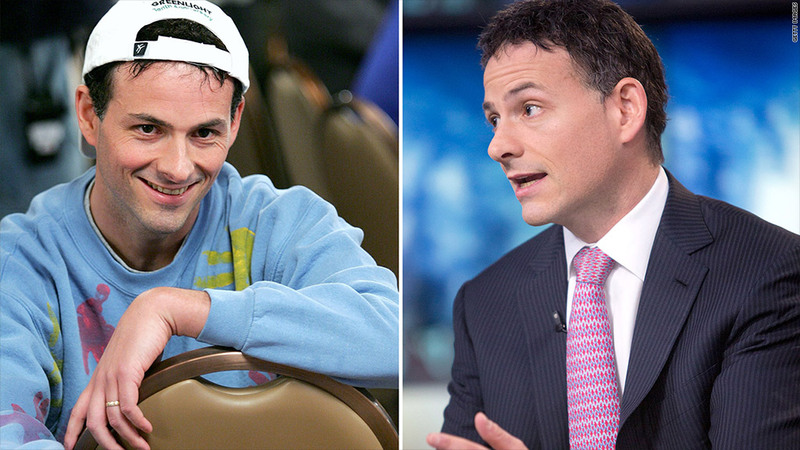 Hedge fund mogul David Einhorn plays poker only a handful of times a year and always for charity -- but he's had some deep runs with the best in the game. In the 2006 World Series of Poker, he placed 18th, good for $660,000. He took third place in another elite $1 million entry tournament, winning $4.4 million. Einhorn, a billionaire, says poker is for fun, and investing is the tougher sport. "The investing world is a little bit more multidimensional than poker," Einhorn said this week on the Thinking Poker podcast. There are similarities, though. Einhorn said he approaches both poker and investing as if he's solving a puzzle. In both, there are things you know: The cards in your hand, a company's financial statements. Then there are the things you can have a hypothesis about. In poker: What is my opponent thinking? How does he play? In business: What is the agenda of the management of the company? What is the psychology of the other people who own the stock? "You can develop a strategy based on what you know and what you suspect," he said. And finally, there is a range of possible outcomes. What cards will come? What's going to happen in the world? What's going to happen in the markets? Put those ideas together, and you can "solve the puzzle." There are some big differences however. "With poker, you have a resolution of the hand within a couple of minutes," he said. "Whereas, even if the thought process in investing is very much the same, you're looking at an outcome that could be 2, 3, 4, 5 years from when you make the original decision. And the mindset related to that is very different." In any case, he's humble about his poker abilities. Describing one big tournament: "I think I got taken advantage of two or three times, but over three days, that's not so bad. However, I probably got taken advantage of a few more times that I don't even realize."